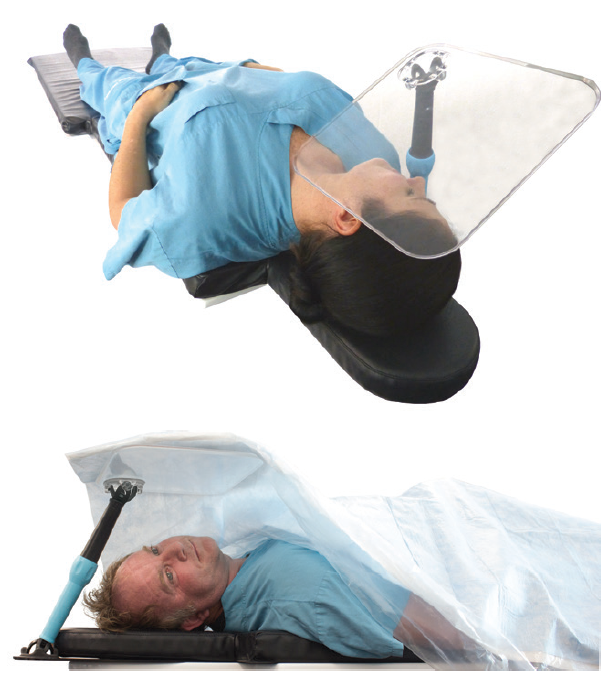 The Drape Support is a versatile sterile drape management device designed to support a sterile drape over the patient’s face. The Drape Support offers many imaging table placement options, with two articulating joints permitting easy maneuverability to suit procedural and patient requirements. The lower axis allows the locking leg a wide range of motion for a variety of procedures. Set up is quick, as the daggerboard slides under the mattress at a convenient position. The adjustable surface supports lightweight equipment, such as syringes and kidney bowls, and is transparent for patient comfort, which is intended to help reduce anxiety. The clear support surface can be manipulated and locked at the desired position. The Drape Support is crafted entirely from radiolucent, high-performance engineering plastics for superior rigidity, durability, and resistance to chemical attack. It is lightweight and compact, taking up minimal space around the imaging table and even less when folded for storage. The device is clinically tested for use in numerous interventional radiology and cardiology procedures, such as antegrade femoral and jugular artery access, transcutaneous pacing, portacath insertion, or as an anesthesia screen. The Drape Support is an FDA registered product. Penumbra, Inc. offers the Indigo Aspiration System now with coronary indication for the Indigo CAT RX Aspiration Catheter. As part of the Indigo Aspiration System, the Indigo CAT RX Aspiration Catheters and Indigo Separator 4 are indicated for the removal of fresh, soft emboli and thrombi from the vessels in the coronary and peripheral vasculature. 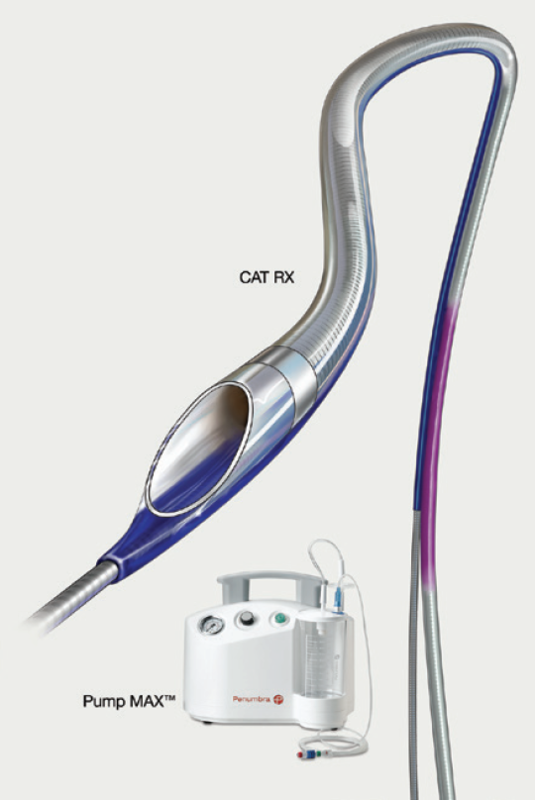 The Indigo CAT RX Aspiration Catheter utilizes power aspiration with the Penumbra Pump MAX. CAT RX has multiple material transitions for advanced trackability and a large aspiration lumen to maximize clot removal. The CAT RX catheter is a rapid exchange platform, designed for deliverability through tortuous anatomy to remove fresh, soft emboli or thrombi from proximal to distal coronary vessels. The Indigo CAT RX Aspiration Catheter is commercially available in the United States. Cordis, a Cardinal Health company, received FDA clearance for its new Railway Sheathless Access System, which is now available in the United States as well as select countries across Europe. The Railway Sheathless Access System is indicated for use in radial arterial procedures requiring percutaneous introduction of intravascular devices. This Cordis device enables direct access to the radial artery with a guiding catheter for planned percutaneous coronary interventions and eliminates the need for an introducer sheath, which reduces the size of the arterial puncture site up to 2 F compared with a conventional sheath system. The Railway dilator can additionally allow the exchange of a diagnostic sheath to a larger guide catheter without increasing the access site. 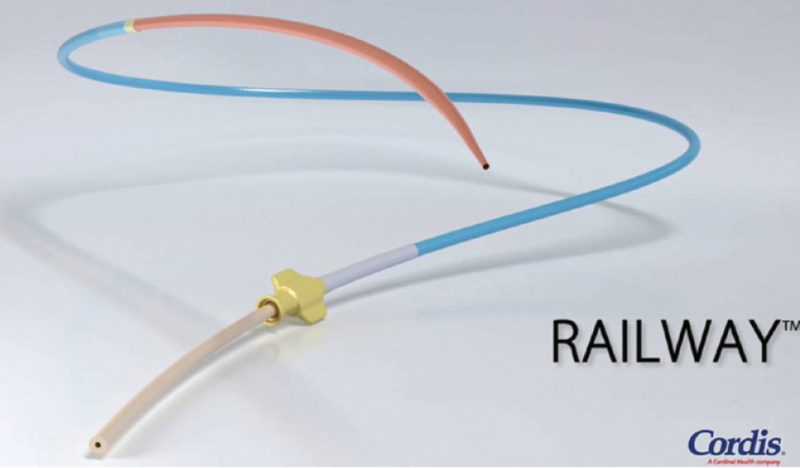 Railway Sheathless Access System is compatible with Cordis 5-, 6-, and 7-F guiding catheters of any shape, including dedicated radial shapes. The device is optimized to fit either Cordis Vista Brite Tip or Cordis Adroit catheters and is compatible with hundreds of other guides. Railway offers smooth transitions from guidewire to dilator and dilator to guiding catheter.